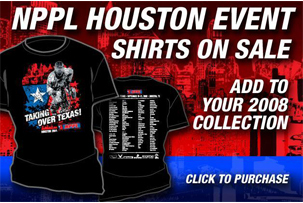 If you didn’t get anything from NPPL Houston, well now is your chance. Then again no one got anything from the event since it didn’t happen. NPPL had shirts made before the event was canceled due to Hurrican Ike. Pacific Paintball probably doesn’t want a whole bunch of shirts leftover from an event that didn’t happen so they decided to sell shirts for $20 each. Sizes range from S-XXL. We had this story 5 days ago, but now the NPPL is announcing that PB2X magazine has been bought by Pacific Paintball who also happen to own them. No new information has been released really, and I don’t really feel like typing up a lot for this, so here’s the whole press release. Pacific Paintball was formed by Pacific Merchant Capital (â€œPMCâ€), a Santa Barbara, California based investment group. The principals at PMC have owned/operated middle market radio stations as well as built several niche media companies, including the largest taxi top advertising company in the United States, which is currently an integral part of Clear Channel Communicationsâ€™ outdoor division. In addition to Pacific Paintball, PMC is currently building Brite Media Group, a leading alternative media business.